Little did I know that I had allowed my Mark Cavendish obsession to push me over the line once again. Things weren’t setting up well for him and his team two days ago as they neared the sprint finish, but suddenly there he was, bursting from the pack and taking the lead. I was cheering him on, thrilled by his imminent stage win. He never loses to anyone once he launches. Except that this time he did. The German rider André Greipel, former Cavendish teammate, charged after him, passed him, and held on to win by a wheel. What went wrong? I don’t know. I don’t want to know. I was too depressed. Surely Cavendish was hurt by not having Mark Renshaw available to lead him out. This probably forced Cavendish to make his move 50m too soon. What I do know is that instead of feeling good all day about having started the day with another great stage, I avoided any thoughts of the Tour. Instead of appreciating Greipel’s magnificent move and huge upset, I tried to erase memories of his joy as he crossed the line. Yesterday was another day for the sprinters. Had I learned my lesson? Was I looking for a great sprint finish, ready to enjoy it whatever the outcome? I would have to see. And see I did. There was Team HTC returning to form as the finish approached, setting up the leadout for Cavendish. There was Renshaw, the last HTC teammate to lead Cavendish out, timing it perfectly. There was Cavendish, launching past Renshaw toward the finish line. And who was that, coming out of the pack to chase after him? Greipel. With Tyler Farrar making his own move. Three great sprinters. One great finish. Whatever happened would make for a glorious day! Cavendish held on. I shouted with delight. It was indeed a glorious day. There’s nothing more fun in sport than watching him win. But there’s more to life than fun, and there’s more to the Tour than sprint finishes. Today, at last, the Tour arrived in the mountains and the tour giants (as well as the would-be giants) finally moved to center stage. I woke up in time to watch the famed climb of the Col du Tourmalet, over the highest road in the Pyrenees. Then after a long descent, they headed up the closing climb of the day, to Luz-Ardiden. It was hard to take my eyes off the riders during the last 10k. For much of the time, not much was happening, but you never knew when one of the Schleck brothers might make a move. Or Cadel Evans. Or a rejuvenated Ivan Basso. And did Contador have any surprises, or is this just not his year, at least not after the badc luck of all his falls last week? No real answers were given as to who has it and who doesn’t. It seems Contador is at least a little off form, as he couldn’t keep up with the Schlecks or Evans in the final 2k. But still, he lost only 13 seconds to Andy Schleck, Evans, and Basso. Tomorrow isn’t likely to reveal much more, as they have just one major climb, of the Col D’Aubisque, before a long descent into Lourdes. Saturday is the day to watch, with a massive closing climb up to Plateau de Beille. Don’t miss it. I almost forgot: How about Thomas Voeckler? 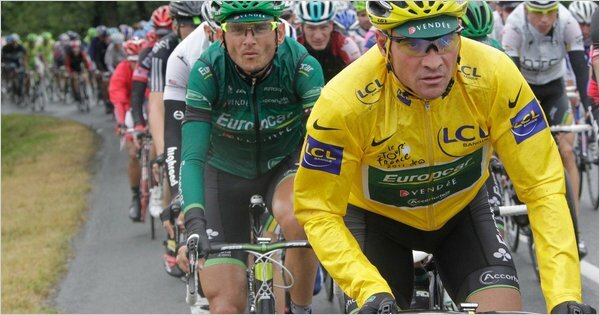 He was sure he would give up the yellow jersey today. No way he would make it over the climbs with the Tour greats. But it was Bastille Day, he’s French, he was in the yellow jersey, and he found a way to keep up with them, finishing just 7 seconds and one position behind Contador on the day. He remains in yellow, 1′ 49″ ahead of Frank Schleck, with Evans, Andy Schleck, Basso, Cunego, and Contador next. I might as well round out the top ten. Today’s stage winner, Sammy Sanchez is in 8th. Surprise top American Tom Danielson is 9th. (Will he last in these heights?) And tenth is Irish rider Nicolas Roche, son of the great Stephen Roche. But back to Voeckler. Magnifique, Thomas!